Increasing cloud cover can be expected this afternoon ahead of the remnants of Hurricane Isaac. As I mentioned Thursday morning, there's likely to be a very tight rainfall gradient from north to south with who sees significant rain/flooding to who squeezes by with only a couple tenths of an inch. Here's the latest QPF (rainfall map) from the Hydrometeorological Prediction Center. Areas just south of I-88 could stand to receive several inches of rain whereas areas to the north will receive less. The rain continues to fall through central Missouri and just to the north of St. Louis, MO. Here's the latest thinking on when the rain will begin tonight: Look for rain to spread north near I-88 by this evening and into northern Illinois by daybreak Saturday. Rainfall along the I-88 corridor will be steady and likely heavy through the day Saturday and possibly even heavier to the south of that. Far northern Illinois could receive up to an inch of rain through the weekend with southern Wisconsin possibly only receiving a half an inch or less. A slight shift in the track will shift the heavy rain north so we'll continue to watch the progression of the low as inland tropical systems can be torrential rainfall producers. While rain during a drought is often times a relief it can also produce flooding if there's too much of it. If several inches of rain were in fact to fall this weekend a flooding concern will arise. Even though the ground is dry the rain is not able to absorb and sink in like it should because the soil is so hard that the rain almost 'bounces' off of it causing runoff and flooding. The latest drought monitor hasn't shown much improvement except in the counties lying just to the south of Lee and DeKalb from what fell last Sunday. The dairy state has pretty much remained the same from last week to this week as well. As the remnants of Isaac lift north from the Gulf into the mid Mississippi River Valley volunteer weather observers have been recording rainfall from their back yards and sending in the reports to the National Weather Service. This could be you too! Learn how to become a CoCoRaHS (Community, Collaborative, Rain, Hail and Snow) observer. Click here for more information! Labor Day weekend is fast approaching and what's left of Isaac may make an appearance for some across the Mississippi River Valley and Great Lakes. Now Tropical Storm Isaac has ever so slowly been moving northwest over the past 24 to 36 hours and still remains in central Louisiana. Significant flooding and severe weather have plagued the gulf states and will continue to do so through the afternoon. Isaac is forecast to slowly lift north into Arkansas and Missouri by the beginning of the weekend and then shift east into central Illinois and Indiana by Sunday and Monday. While we're hopeful to get some rainfall from this, even if it's a holiday weekend, it appears as if the heaviest of the rain band may end up developing south of northern Illinois. As the remnants of Isaac begin to lift north there will also be an area of high pressure drifting south out of Canada pushing a weak cool front through Wisconsin. This front may pass through northeast Illinois late Friday but behind it will be a cooler and drier air mass. Thanks to an easterly wind this weekend the drier air may inhibit the northward extent of Isaac and keep it a little further south. There isn't much in the upper levels of the atmosphere to help steer Isaac so this is also contributing to the slow movement. This will also cause it to slightly weaken as the system travels further north. Also, with the track of the low moving through central Illinois the greatest lift and therefore greatest rainfall potential usually will lie just to the north/northeast of the low. This is the three day QPF (rainfall forecast) from the Hydrometeorological Prediction Center running through Sunday morning. The red and orange colors indicate rainfall amounts in excess of five inches. Notice how the bulk of this precipitation is mainly south of I-80 with a fairly sharp decrease in totals across northern Illinois. This is due to the cool front and dry air that will be in place across the upper Midwest. I've kept the rain threat in the forecast for the weekend but there is also a possibility that we might not see much at all; especially if the low shifts a little further south. It's hard to believe it's already been seven years since one of the most destructive natural disasters in U.S. history. It's even harder to believe that we're remembering the anniversary as another tropical storm, Isaac, rolls through the exact same area. John Lawrence, one of our weather watchers, was in New Orleans doing work for the Salvation Army about a month after Katrina hit. He was kind enough to share some of the photos he took while he was there. How Much Rain Could Isaac Bring? If Hurricane Isaac stays on its forecasted path, the Stateline could see some showers and storms from Isaac's remnants this weekend. This wouldn't be the first time the remnants of a tropical storm has hit the Stateline, but it begs the question: How much rain could we see? Here's a map showing all the tropical systems that have hit the Stateline since the late 1800s. There are 17 storms on record, but only 14 have actual rain data to go along with it. If you look at past history, we have a good chance of seeing decent accumulations over the weekend. The average rainfall of the 14 storms we have data on comes out to just over an inch of rain per system. We were especially busy in 2008 when the remnants of two storms (Gustav and Ike) dropped close to five inches of rain on Rockford in just under a month.Chicago saw ELEVEN inches of rain from those two storms. The current forecast isn't nearly as ambitious, but still shows decent rainfall (Up to 0.50") between Friday night and Sunday from Isaac. Since the forecast path of Isaac is constantly changing, any movement in the storm could affect our forecast greatly, especially in the rain department. Stay tuned for more updates! High pressure sprawls from northern Wisconsin to another center over Missouri to yet another over the Colorado. It will be mostly sunny and very warm today with a high in the upper 80's. A disturbance over South Dakota has spawned an area of showers and thunderstorms this morning over the eastern Dakota's into western Minnesota. High clouds from that complex will overspread the Stateline this afternoon, but will be the cirrus type that will allow the sun to shine through. Winds will be light today under the influence of high pressure. Tonight remnants of that disturbance will be edging eastward, and may cause a few stray showers and thunderstorms into southwestern Wisconsin and far northwestern Illinois. The showers and storms are not expected to reach into the north central part of Illinois because the residual dry air in place here. It will be partly cloudy tonight with a low near 60 degrees. Clouds from the disturbance to the west will make for a partly cloudy start to the day on Wednesday, but the disturbance will weaken, and fade away as the large high builds into the area once again. This time, however, the Stateline will be on the west side of the high, and with southerly winds developing, and full sunshine, the temperature will top out around 90 degrees. Heat and humidity will continue to build with high temperatures on Thursday and Friday in the middle 90's. A cool front will push southward across the area early Friday night as the remnants of Isaac reach into southern Illinois. It will be cooler on Saturday with a chance of showers and thunderstorms. Chances of showers and thunderstorms will persist through Sunday. High temperatures on Saturday and Sunday will be in the middle 80's. High pressure will make an attempt to take control of the weather on Labor Day. Skies are expected to be partly cloudy as afternoon temperatures top out in the middle 80's once again. 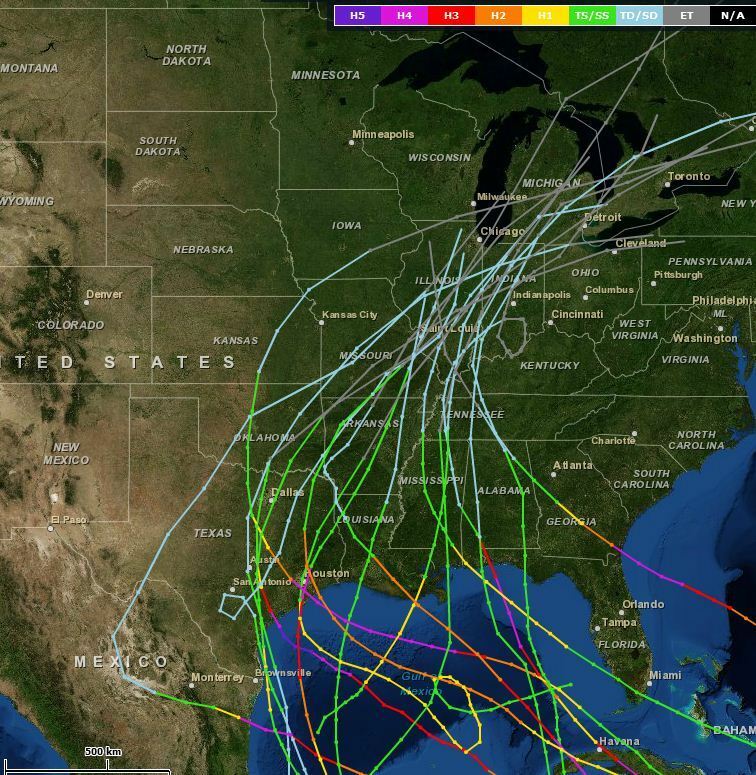 Tropical Storm Isaac: Impact on the Stateline? The latest news on Tropical Storm Isaac isn't good. The storm is gaining steam and could be a hurricane in the next 24 hours. Winds are currently around 70mph. Model runs still show a lot of uncertainty with the movement of this storm, but the general consensus is that the Mississippi and Louisiana coasts (including New Orleans) will see the best chance for landfall. The official forecast has Isaac hitting New Orleans and then moving north over the coming days, which asks an important question: Will Isaac play a role in our forecast? 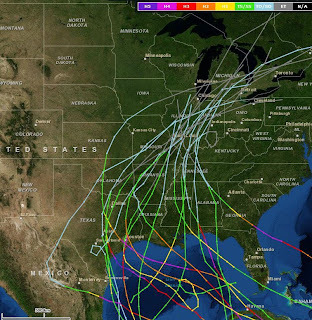 Once again, model runs are all over the place with the exact path of Isaac. One model has Isaac making a BIG left turn, with the remnants of the storm ending up in Iowa. If that's the case (although probably not), we will definitely see some rain. Most of the other models has the remnants of Isaac staying to our south. That could give us some rain chances overnight Friday into Saturday, but at this point, a lot could change. We'll keep you updated as we go through the week. Skies will be sunny to mostly sunny today. High pressure over the northern plains has taken control of Stateline weather. Despite the fact that winds will pick up to 10 to 15 mph from the northwest this afternoon, the temperature will still rise into the upper 80's. However, there will be a noticeable drop in humidity as the day goes on with dew points dropping back into the middle 50's by late afternoon. Tonight will be clear and cooler with the ridge of high pressure remaining to the west of the area. The overnight low will be in the upper 50's with northerly winds become near calm overnight. There is a chance of some patchy fog developing late tonight. By early Tuesday morning the high will be over Lake Superior with a ridge southward right through the Stateline. It will be sunny with a high in the middle 80's on Tuesday. The wind will be light and variable, and the humidity... comfortable. By Wednesday evening the high will be situated over the door peninsula with the ridge maintaining itself right across northern Illinois, so it will be clear and comfortable again with a low in the upper 50's. By Wednesday morning the high will be over Michigan, and the ridge will still be with us. It will be sunny again, and the temperatures will be edging up toward 90 degrees. On Thursday morning the high will be over Pennsylvania, and the ridge will still be across our area. It will be hot with a high in the low 90's with increasing humidity levels. It will still be hot on Friday under mostly sunny skies. Humidity levels will continue to rise as the remnants of Isaac move up the Mississippi River. Friday's high temperature is likely to be in the low 90's again. On Saturday Isaac remnants may move into southern Illinois pulling gulf moisture northward into the Stateline. That will set the stage for possible thunderstorm development. Temperatures will fall off a few degrees into the middle 80's on Saturday afternoon because of increased humidity, more clouds, and possibly rain cooled air associated with thunderstorms. It will be partly sunny on Sunday with a high in the middle 80's. I'll admit that I'm not completely sold on this, or any, idea that changes what naturally occurs in the atmosphere. But there are a team of environmental scientists who believe cloud seeding could ultimately weaken the strength of a hurricane by one category. ﻿ The article (found here) states that in a paper published in the Atmospheric Science Letter the authors "propose using cloud seeding to decrease sea surface temperatures where hurricanes form. Theoretically, the team claims the technique could reduce hurricane intensity by a category." Now I'm not an expert in cloud seeding projects but I do know there have been many to try and create rainfall in drought stricken places and to my knowledge, they haven't been completely successful. What this project proposes is that rather than seeding storm clouds or hurricanes directly they would seed the marine stratocumulus clouds which cover an estimated quarter of the world's ocean to try and prevent hurricanes from forming. To understand what exactly this means we first need to understand what cloud seeding is. Cloud seeding is an intentional weather modification where the process of either dry ice, or more commonly silver iodide aerosols, are added into the upper part of a cloud; typically a storm cloud to encourage the precipitation process and produce rain. Most rainfall starts through the growth of ice crystals from super-cooler water droplets (droplets that are below the freezing temperature) in the cloud. The silver iodide particles act as nuclei for these super-cooled water droplets to form around and 'theoretically' help promote the growth of new ice crystals. What this paper is suggesting is that instead of putting the these particles directly into the hurricane, which was once attempted and failed, scientists will target the marine stratocumulus clouds in the Atlantic to try and create more cloud cover therefore reducing the amount of sunlight that reaches the ocean. Tropical systems gain their energy from the warm sea surface temperatures. If the sun can't reach the ocean then the temperature would decrease, therefore weakening the approaching hurricane. Unfortunately, this may also have an impact on the amount of rainfall surrounding regions see. within recent years what would be the long term affects of this potential project and how might that affect our climate in the future? What do you think? A neat phenomenon occurred earlier this morning in Wisconsin ahead of showers/thunderstorms that were moving through southwest Wisconsin. This is Milwaukee's radar from roughly 8:30 this morning and what's interesting with this image is the radar is detecting what's known as an undular bore, which is like a gravity wave. It appeared as narrow parallel bands of light reflectivity on the radar. These typically form within an area of the lower level of the atmosphere that is stable ahead of an approaching outflow boundary from nearby storms or a cold front. These types of waves are propelled by the transfer of energy from an approaching storm. It's similar to the waves created when you throw a pebble in the water or the waves created when a boat moves through a river or lake. The object displaces the water, or the air, in the atmosphere causing it to move upward, but because of gravity the wave is pulled back down. Pretty cool! Skies will start partly cloudy this morning as a trough of low pressure moves through Iowa and Wisconsin. Showers and embedded thunderstorms have formed along that trough and are currently moving northeast. Dry air across the immediate region will keep the majority of the rain to the northwest with the best possible chance for rain in southern and central Wisconsin. The tail edge of the rain has been developing a bit so this will need to be watched through the day. Most will remain dry with temperatures likely back in the low 90s. It may be a little cooler north where the cloud cover and rain prevail through the morning. Doesn't look like too much has changed in terms of the extreme drought that continues to plague the Stateline. Most of Illinois is still under severe to extreme drought. At the moment, our western counties are doing just a shade better than everyone else. 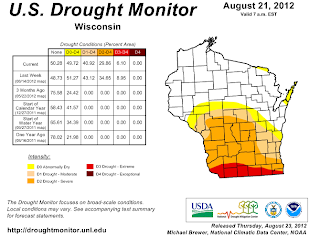 Wisconsin continues to see a very small area affected by extreme drought conditions, but that area continues to be the Stateline counties. Not too many rain chances in the current forecast. Our best shot of seeing showers and storms will be overnight Saturday through early Monday morning. With an official high of 93 on Thursday, we continue to be reminded just how hot this summer has been. Rockford now sits at 42 days with highs in the 90s this year. That's double the average for a normal year. Another sign of the heat? Meteorological summer is over at the end of August. If things hold up, this will be the third warmest summer for Rockford on record. Tropical Storm Isaac has formed in the Atlantic and could possibly turn into a hurricane within the next day or two. Air Force Reserve Reconnaissance aircraft this morning will continue its fly through Isaac gathering data. Current wind speed within the storm is 45 mph with a central pressure of 1004mb. Earlier this morning, the reconnaissance flight didn't find too much of a drop in pressure as the storm moves west around 19 mph. High pressure in the Atlantic will continue to steer Isaac to the west. An intensification is anticipated within the next 24 to 48 hours but then it may decrease in intensity when it reaches Cuba as it runs into land. Right now the current storm track takes Isaac through Puerto Rico, Cuba and possibly near southeast Florida by early next week. Where exactly Isaac makes landfall, if it does in fact affect the U.S., may have an impact on our weather by the middle of next week. After a beautiful stretch of 70 degree weather the last several days, it looks like temps are going to warm back up. Our next warm-up means this summer will more than likely stay in the record books as one of the hottest ever. As of Monday, the average temperature this summer (June-August) has been just over 75 degrees. That's good enough for third all time. Expect highs to warm well into the 80s starting Wednesday and maybe even the 90s later this week into the weekend. The Climate Prediction Center has us under warmer than average temperatures through the end of the month, meaning we'll probably stay in Top 5 territory by the time meteorological summer wraps up on August 31st. The latest issuance of the drought monitor last week showed the extreme drought conditions haven't improved much, but they also haven't worsened across the area. The drought has remained fairly steady the past two weeks and each rainfall we receive will help (even if it's a little) with the current drought. With just two short weeks of August left it's nice to see we've received a little over two inches of rainfall this month, but it still puts us close to an inch below where we need to be for the 21st of August. There may be, however, a little light at the end of the tunnel. The seasonal drought outlook from the National Drought Mitigation Center, which is valid from August 16th to November 30th, indicates an improvement in the drought conditions while a persistent drought remains likely for the central/southern Plains and southwest. It's important to note that this doesn't necessarily mean a complete elimination of the current drought and will likely mean only a slight improvement from the extreme conditions to possibly only severe. It takes time to recover from extreme droughts which may be something we won't fully begin to feel until next year. A multi centered sprawling high pressure area is sitting over the north central and northeastern United States. It is Canadian in origin, and has brought pleasant comfortable conditions to a large area of the USA from Montana eastward through the Great Lakes to New England, on the north side, and from northern Texas eastward across the northern part of the gulf coast states to the northern North Carolina Coast on the south side. A disturbance dropping southward across Wisconsin and Lake Michigan into Illinois late today spawned some severe thunderstorms along the western shoreline of Lake Michigan from Lake county through parts of the Chicago land area into northwestern Indiana. Later showers and some thunderstorms developed along the westward moving lake breeze. The showers developed southeast of Belvidere, and moved slowly southeast along I-90 intensifying into thunderstorms by the time they reached around Hampshire and Elgin. Gradually the activity has subsided later this evening. Skies will be clear overnight, and the low will be in the low 50's with light winds. On Tuesday high pressure will still be nearly overhead, but will be slipping to the southeast. It will be sunny with a high around 80 degrees. The wind will be light and variable, and the humidity will be low. Enjoy the day! It looks like the best day of the week. On Wednesday it will be sunny and warmer as the high pressure ridge shifts toward the southeast. A light southerly wind will develop, and temperatures will rise into the middle 80's. Thursday looks like it will be the warmest day of the week with an afternoon high in the middle 80's under mostly sunny skies. Humidity levels will increase on Friday with the southerly wind flow continuing. Scattered showers and thunderstorms will develop, and continue in the picture on Friday right through the weekend. The best chance of any significant rainfall, however, will be on Monday when quite humid air will be in place, and a new cool front will be approaching from the northwest. A weak cool front that dropped southward across Wisconsin on Sunday is moving across the Stateline this evening. It is poorly defined, and hard to find, and will fade from the picture before morning. It did provide enough instability along will cold air aloft to spawn pop corn showers and thunderstorms during the afternoon. They persisted into the evening, but have faded rapidly with the stabilizing atmosphere after sunset. No widespread good rainfall was reported, but there were some widely scattered decent rainfall reports. The Freeport area probably fared as well as any with around 1" indicated by Doppler radar. The Rockford airport only recorded 0.06", and the extreme drought continues with Rockford more than 8" below average for precipitation year to date. Not much drought relief is expected during the next 7 days, but there is at least potential for some thunderstorm development from Friday through Sunday with a pattern change from the recent high amplitude pattern that brought a nice supply of Canadian air into the country east of the Rockies. The pattern will become more zonal, or west to east, as the week progresses. That will allow temperatures to moderate back into the 80's. Also, the surface fronts lying to our south will gradually dissipate allowing more humid air from the Gulf of Mexico to slowly ooze northward across the midwest before the end of the week. It will get warm with those temperatures going above average for a few days, but no excessively hot weather anticipated any time soon. In fact, in contrast, it looks like the following week, from Monday August 27th through Sunday September 2nd, will have below average temperatures once again, and it's looking like that week could actually have slightly above average rainfall. The Stateline had another wonderful very comfortable fall like day on Saturday with an afternoon high at the Rockford Airport of 77 degrees. It will not be as cool tonight with clouds increasing in advance of a southward dropping cool front over Wisconsin. The low will be around 56 degrees with light winds. On Sunday the front will graze the area, and there could be some light rain showers and possibly an isolated thunderstorm in the afternoon. The high on Sunday will be in the middle 70's again under variable clouds and some sunshine. A few showers may linger into Sunday evening. It will remain mostly cloudy on Sunday night as the front slowly dissolves just to the east of the area. The low will be around 54 degrees with light winds. On Monday, even though high pressure will be approaching from the northwest, an upper disturbance, and quite cold air aloft in this northwesterly flow, will make conditions unstable enough to possibly generate a few instability showers during the afternoon hours. Any rainfall that occurs will be on the light side. Skies will be partly cloudy on Monday with another high temperature in the middle 70's. On Monday night skies will clear, and temperatures will drop into the low 50's as the Canadian high pressure over Minnesota takes full control of Stateline weather. On Tuesday it will be another fabulous August day with full sunshine, low humidity, and light winds. High temperatures on Tuesday will be in the upper 70's to around 80 degrees. The high will start to shift more to the east and southeast, and by Wednesday a light southerly wind will develop. It will be sunny again, and the afternoon high will be around 83 degrees. On Thursday there will still be enough influence from the high, even though the center will be over Pennsylvania, to provide mostly sunny skies. Temperatures will heat up above average to around 85 degrees. Southerly winds will begin to pump in more moist air by Friday. A weather system will be approaching from the plains, and there will be a slight chance of showers and thunderstorms by late in the day. It will be very warm again with temps topping out in the middle 80's. It will be more humid on Saturday, and with the plains system edging closer to the Stateline, chances of showers and thunderstorms will increase. Now this was one fabulous day. Our area had gorgeous blue skies, light northwesterly winds, and low humidity. The temperature was a few degrees below average with most afternoon highs across the area in the middle 70's. The reason for this beautiful weather was a sprawling Canadian high centered over Nebraska. With the high to the west the Stateline has a light northwesterly wind flow. The area is likely to see the coolest temperatures overnight that we have seen since last spring. It appears likely that the lows tonight will be in the upper 40's across northern Illinois, eastern Iowa, and southern Wisconsin. The record low for Rockford for tonight was set back in 1963 at 45 degrees. Saturday will be a mostly sunny day with a few more clouds in the afternoon. The high will be in the comfortable upper 70's, which is a few degrees below average for this time of year. A weak cool front will drop southward into central Wisconsin on Saturday night. It will generate some light showers over Wisconsin. On the front will dissipate, but a weak disturbance associated with the remnants may cause some light rain showers across the Stateline. It will be partly cloudy, and the high temperature will be in the middle 70's on Sunday. There is a slight chance that showers may linger into the evening. The rest of Sunday night will be partly cloudy with a low in the low 50's. It will remain comfortable on Monday under partly cloudy skies that may yield a stray light shower or two. On Tuesday the center of the Canadian high will shift well to the east, the Stateline will begin to warm back up with southerly winds coming back across the area. It will be sunny with a high around 80 degrees. A gradual warming trend will take place during the rest of the week under partly cloudy skies. By the time we get to Friday it will be warm with a high in the middle 80's. Temperatures have been split for the month of August: half have been either at or above average while the other half have been below average. Compare this to the past two months and it seems a little out of place. June had a total of six days below average and July a whopping one! Highs through the weekend will be more typical of what we would feel in September with afternoon temperatures in the middle 70s. I hope everyone enjoys the weekend! Check out this video from The Weather Channel. Strong winds in Calgary, Canada brought down this highway sign! Moisture interacting with a strong cool front moving from west to east through the area today spawned some thunderstorms early today. The Rockford area did not get much rainfall... only about a third of an inch, but every little bit helps. With the front moving off to the east tonight skies will become clear a cooler and drier air moves in from the plains. The overnight low will be in the low 50's. A large cool Canadian high pressure system stretching from Alberta to Nebraska will dominate Stateline weather for the next few days. It will be sunny and very pleasant on Friday with an afternoon high around 74 degrees. Wind will be northwesterly at 10 to 15 mph. The real cool air will settle into the area on Friday night with the temperature falling into the upper 40's under clear skies. Northwesterly winds will become calm overnight. The record low on Friday night in Rockford is 45 degrees. On Saturday the high will sprawl from Manitoba to Iowa to Pennsylvania, and provide mostly sunny skies across the mid west. Temperatures will continue to be comfortable with afternoon highs in the middle 70's with light winds. The high pressure will remain the dominant feature on Sunday, but a weak disturbance will cause a few more clouds, and may cause a couple of light showers to pop up. On Monday the ridge will take full charge as it sits right across the central part of the mid west. It will be partly cloudy with a high near 77 degrees. Finally, on Tuesday the high will shift off to the east, and our winds will become southerly warming temperatures back up into the low 80's, which is pretty close to average for this time of year. On Wednesday the next cold front will approach from the north dropping southward across Wisconsin. There will be a slight chance of showers and thunderstorms, and the high will be around 83 degrees. On Thursday the front will become stationary east/west right across the northern part of Illinois. Scattered showers and thunderstorms will be possible as the temperature heats up into the low 80's during the afternoon. 9:30am Update: Rainfall coming to an end with a little drizzle possible through the morning. Rainfall totals range anywhere from a quarter inch in Rochelle to almost 0.70" in DeKalb. 7:55am Update: Strongest of the storm is now east moving closer to Chicago. Moderate rainfall will continue this morning with a few embedded storms. Rainfall nearing half an inch to three quarters inch will be likely. Storms will clear from west to east by noon with mostly cloudy skies expected later today. Any rainfall totals would be appreciated! 6:45am update: Thunderstorms now moving through will continue to produce gusty winds and heavy rainfall. These storms will be near Belvidere within the next 5 minutes as well as Stillman Valley, Davis Junction and Rochelle. There are a few stronger wind gusts ahead of the main line of storms. 6:00am update: Stronger storm now moving through central Green county in southern Wisconsin. Pea sized hail and wind gusts near 45 mph remain possible. 5:30am update: A line of thunderstorms have now crossed over the Mississippi River and are entering into western Jo Daviess county. Storms are also expanding in coverage across southern Wisconsin. Look for storms to enter into Stephenson county by 6:15am and near Rockford around 7am or a little after. Severe weather is not anticipated with this line, however, frequent lightning and heavy rain will be the main concerns. There may also occasionally be a wind gust near 45 mph. After a record breaking July in terms of the heat, August has been a much different story across the Stateline. In fact, we have already seen seven days of below normal temperatures in August, which matches what we saw in June and July combined! If the current forecast holds up, we're looking to add onto that cool streak in a big way. Wednesday will warm up into the upper 80s before a cold front knocks temperatures into the 70s for several days.In case you were wondering, the average high in August is around 82, so we're talking several days of highs around 10 degrees below normal. Record breaking heat and extreme drought this summer will be on the minds of many for the next several months but it's nice to see a forecast a little more representative of fall-like weather. Persistent high pressure during the month of July brought several days of 100 degree, or higher, heat across the mid-section of the country. Unfortunately, this heat remains for some but for others a pattern change within the jetstream will bring a taste of fall by this weekend. So, what's the cause for the cooler weather? A high latitude blocking pattern near Greenland will occur and in turn this causes the jetstream to buckle and dip south across the Great Lakes. A developing trough of low pressure in the middle of the atmosphere will also strengthen helping induce below average weather for many. After a strong cold front moves through Thursday afternoon highs will drop nearly 10 degrees below the average. As I mentioned before the average high for this time of year is in the low 80s and it looks like temperatures will only reach the low 70s; especially for Friday and Saturday. These temperatures are more typical of what we would feel towards the middle and end of September. Due to the strength of both the trough in the Great Lakes and ridge near Greenland it will be difficult to break this pattern which may allow the cooler weather to stick around through the end of August! Sunday was the fourth day in a row where temperatures were below 80 degrees and this afternoon will make it the fifth. After a brief return of the 80s by the middle of the week it looks as if the chill will return by the end of the week and into the weekend. An amplified blocking pattern will begin to develop mid-week with a strong upper level low near Hudson Bay as what appears to be a Greenland Block trying to develop. This is when high pressure develops near Greenland and in turn forces the jetstream southward across the U.S. This will cause the jetstream to move as far south as the mid-Atlantic and bring below average temperatures through the weekend. Average highs for the middle of August should be right around 83 degrees and as it stands right now it looks like highs by the end of the week will run a good ten degrees below that in some locations. In fact, the cooler weather looks to stick around for the next week and a half to two weeks. The Stateline recorded the 4th day in a row with high temperatures in the 70's. Today's high of 73 degrees is the first time we have had a high below 74 degrees since June 1st when Rockford recorded a 68 degree high. It appears as if the scorching hot summer is over... well, maybe not, but it is certainly on leave. The 73 degree high temperature was 10 degrees below the average high for the date. The extended forecast which goes out 2 weeks continues to indicate below average temperatures. The highs across the area were in the low to middle 70's. The temperature was prevented from going higher by a persistent deck of clouds. Those clouds are associated with a weather system that are moving into the area tonight. Rain will be likely with this system overnight, and there is even a slight chance of some embedded thunderstorms in spots, mainly well south of Rockford in area near Interstate 80. There is still potential for some pretty good rainfall amounts up to 1". The best chances of good rainfall will be between US 20 on the north and Interstate 80 on the south. That does include almost all of the Stateline. Rain showers will taper off later Monday morning into the afternoon. It will be relatively cool again under the clouds with a high in the Rockford area around 74 degrees. The system will move off to the east on Monday night and skies will become mostly clear by morning. the low will be in the upper 50's. Tuesday looks like a nearly perfect day with a high in the low 80's under lots of sunshine. Conditions will warm up on Wednesday in advance of the next system. It will be partly cloudy with a high in the middle 80's. It appears as if Wednesday will be the only day in the next 7 days to have a warmer than average high temperature. A strong cool front will move through the area on Thursday into Thursday night. There will be scattered thunderstorms on Thursday, and there will be a pretty good chance of thunderstorms on Thursday evening. It will be considerably cooler on Friday, and stay that way through the weekend. It will be mostly sunny to sunny with highs only in the low 70's, and nighttime lows will be in the low 50's. Our fabulous stretch of comfortable cooler weather continued on Saturday with the afternoon high reaching the upper 70s under sunny blue skies along with light northerly winds. It will start out mostly clear early tonight, but skies will quickly become partly cloudy tonight. Most of those clouds will be high thin cirrus between 20,000 and 25,000 feet. Stars will be visible through the clouds from time to time. These clouds are forerunners of a weatther system that will move across the Stateline on Sunday night and Monday with the potential for some nice rainfall totals between 0.50" and 1.50". It will be cool overnight with a low in the low to middle 50's. Sun will filter through the clouds in the morning, but there enough energy getting through to push the temperatures into the upper 70's again in the afternoon. The weather system approaching from the west could bring some widely scattered light rain showers to the area in the afternoon, but the real action will hold off until Sunday night which will be cloudy, and rainy with the potential for a few thundertorms. There will be little or no wind early on Sunday night, but southerly winds will develop across the area and blow around 10 mph. The low will be near 60 degrees. Rain will linger into Monday with the most significant rains in the morning hours. It will be relatively cool under the clouds with an afternoon high around 74 degrees. Overnight temperatures will fall to the low 50s. This is better than what we have been dealing with all summer, and it is a great time to give the air conditioners a much needed break. The winds will be on the strong side as the low pressure system continues to push off to the east, and gusts could easily reach the upper 20s to lower 30s. However, the winds will diminish by tomorrow afternoon. Unfortunately, our rain chances are not looking to improve a whole lot, so it will still be quite dry out there. With summer fading and fall just right around the corner you may be planning one more weekend getaway - perhaps to the north in Wisconsin. Most of this weekend is going to be perfect. A little cool, but nice. A large area of high pressure settling into the Midwest will pull cool, dry air south from Canada keeping temperatures in the mid and upper 70s for both Wisconsin and northern Illinois. Saturday looks to be the best day out of the two. Mostly sunny skies and highs reaching the mid 70s. Sunday in northern Wisconsin should remain quiet but central and southern Wisconsin could be dealing with a few showers as low pressure builds in the Plains and moves through central Illinois by Sunday night. Rip currents and water spouts will threaten the shores of Lake Michigan today and tonight as a strong area of low pressure moves into the state of Michigan. With northerly winds increasing to 30 mph this afternoon rip currents will become a growing concern near the shore. If you thought maybe you'd take a trip out east this weekend be prepared to stay away from the lake and even the bike paths along the lake shore. Do you know what to do if you're caught in a rip current? First, rip currents are powerful channels of flowing water moving away from the shore. They typically occur in low spots or breaks in the sandbar and even occur on the Great Lakes. To the untrained eye they are hard to spot so that's why it's important to know what to do if caught in one. You never want to try and swim against the rip current because even the most experienced swimmer can tire quickly. First and most, don't panic. You want to swim parallel to the shore until you're out of the current. Once out swim towards the shore. If you're unable to swim out of the current let it take you out, then swim parallel to the shore. Once out, swim towards the shoreline. If you still are having trouble try to draw attention to yourself by waving your arms and yelling to get the attention of the lifeguard. Second threat for today will be water spouts. Cool air moving over the warm waters of Lake Michigan will help generate instability and allow for storms to form, especially early in the day Friday. Water spouts usually remain over the water and don't pose a threat to people on land but everyone once and a while they do move onshore and can become a tornado. As the low moves further east the threat for water spouts will diminish but rip currents and high waves remain a threat. A couple water spouts have already occured this morning near Ft. Sheridan Beach and only lasted about one minute. It's been a common theme the last several weeks. Showers and storms here and there, but not enough to help with drought conditions. 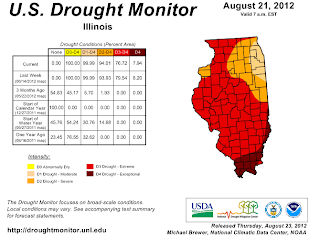 The latest drought monitor released Thursday morning shows worsening conditions for Illinois. Extreme drought conditions continue to spread, with more than 80% of the state now under that classification. 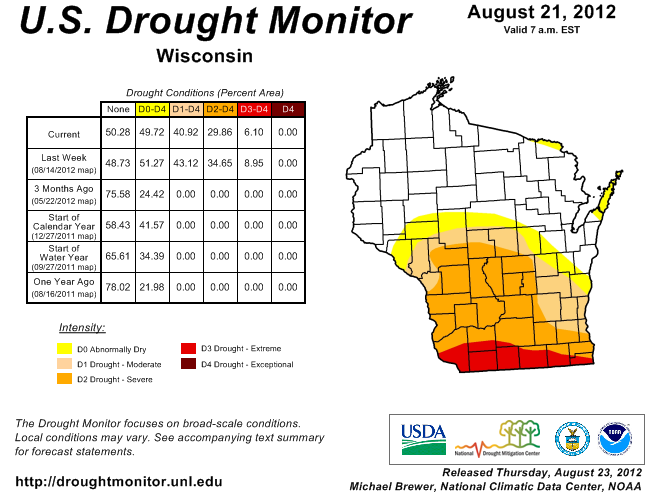 Wisconsin continues to see little change in its drought conditions. About 10% of the state is under extreme drought, including the Wisconsin part of the Stateline. After today's rain, the forecast shows few rain chances, with isolated rain chances on Monday the only shot at precip we have over the next seven days. July 2012 was the hottest month on record for the U.S. It really doesn't come as a surprise that the latest climate issue from the National Climatic Data Center for the month of July shows it being the hottest month on record for the United States. Drought conditions cover roughly 63% of the nation and wildfires have burned nearly 2 million acres! Precipitation totals were mixed during July, with the contiguous U.S. as a whole being drier than average. The nationally averaged precipitation total of 2.57 inches was 0.19 inch below average. Near-record dry conditions were present for the middle of the nation, with the drought footprint expanding to cover nearly 63 percent of the Lower 48, according the U.S. Drought Monitor. The current cloud cover will continue to thicken before possibly thinning a bit by this afternoon. A series of upper level lows moving through the Midwest will help usher in below average weather by the end of the week. The first is what's left of overnight thunderstorm activity in Iowa. While the rain shield has thinned a bit in northeast Iowa a 'mini' low has developed and will move into northern Illinois shortly afternoon noon today. This will help keep the cloud cover around but also bring the threat for a few sprinkles or light rain showers by this afternoon. A second and stronger low in Minnesota will swing through this evening. Skies have been clearing in central and western Iowa between the two systems and it's there that strong to severe storms could develop ahead of the second low later this afternoon. The threat for rain will increase overnight into Thursday morning and it looks like a decent amount of rain could occur. While model rainfall outputs have varied a bit the past couple days some locations could receive close to three quarters of an inch with higher amounts possible in thunderstorms. The main upper level low will amplify by Thursday afternoon as it moves across the Great Lakes and if skies clear enough and instability builds the threat for stronger storms may exist just south of Rockford. Unseasonably cool air will accompany the low and as that cooler airmass moves over the warm waters of Lake Michigan lake effect rain will set up for northeast Illinois by Thursday night. Another threat for the shores of Lake Michigan will be waterspouts Thursday evening! Rain Chances = More Severe Weather? Some pretty good rain chances move in for Wednesday night and Thursday, which is good news for ongoing drought conditions. While we're not expecting anything that will break the drought, every little bit helps, and the latest models are showing a half inch of rain possible in our next storm system. But it's been the case this summer that most rain chances come with the threat of severe weather. The Storm Prediction Center currently has us just north of a slight risk for severe weather on Thursday. Obviously, the situation can change between now and then, so we'll keep an eye on it, but don't be surprised if we see a few storms with gusty winds heading into Thursday. WHILE THE SEVERE WEATHER SEASON WAS QUIET AT ITS NORMAL PEAK TIME OF SPRING AND EARLY SUMMER ACROSS NORTHERN ILLINOIS AND NORTHWEST INDIANA...IT HAS BECOME MORE ACTIVE SINCE THE TAIL END OF JUNE. NEARLY 80 PERCENT OF THE PRELIMINARY SEVERE WEATHER REPORTS ACROSS THE NWS CHICAGO COUNTY WARNING AREA THIS METEOROLOGICAL SUMMER /JUNE-AUGUST/ HAVE BEEN CONVECTIVE WIND DAMAGE AND/OR OBSERVED GUSTS. THERE HAVE BEEN APPROXIMATELY 225 PRELIMINARY REPORTS OF EITHER WIND DAMAGE OR SEVERE CRITERIA WIND GUSTS /58 MPH OR STRONGER/ RELAYED TO NWS CHICAGO SINCE JUNE 1ST. SOME OF THE SEVERE WINDS HAVE BEEN EXTREMELY LOCALIZED IN THE FORM OF MICROBURSTS...WHILE OTHERS HAVE BEEN WIDESPREAD WIND EVENTS SUCH AS WHAT TRANSPIRED THIS PAST SATURDAY AUGUST 4TH. THUS IT IS CHALLENGING TO TRY AND QUANTIFY THE NUMBER OF THESE GUSTY THUNDERSTORMS VERSUS A NORMAL AND HAVE IT BE REPRESENTATIVE EVERYWHERE. LOOKING AT PEAK CONVECTIVE GUSTS AT TWO INDIVIDUAL AREA AIRPORTS CAN SHED SOME LIGHT HOWEVER. REGULARLY CAPABLE OF LONG-LASTING WIND EVENTS. ROCKFORD HAD FOUR DAYS WITH 40 MPH CONVECTIVELY INDUCED GUSTS IN JULY ALONE...TYING IT WITH JUNE 1998...JULY 2003...AND JUNE 2008 FOR THE MOST IN ANY ONE SUMMER MONTH. Our streak in Rockford of consecutive days with highs of at least 80 degrees may come to an end by Friday. As of Monday, Rockford has seen 54 consecutive days with highs of at least 80 degrees. This ranks as the 4th longest streak in Rockford's history. The longest streak is 86 consecutive days back in 1895. The last time Rockford's high temperature was less than 80 degrees was all the way back on June 13th. If we can stay at or above 80 degrees through Thursday, that will put us 1 day short of the 2nd longest streak, which is 58 days back in 1936. It's possible we will top out at 57 consecutive days (which would rank 3rd), as temperatures will likely cool into the 70s by Friday as strong high pressure in the southwestern part of the US and a trough of low pressure in the Great Lakes region will help to pull in cool Canadian air from the north. We will see a slight chance of storms on Tuesday and Wednesday as a weak cold front to our northwest moves through the region. A better chance of storms will come late Wednesday through Thursday as another disturbance and stronger front moves through. The day 3 convective outlook from the Storm Prediction Center for Thursday shows the area of possible severe weather just to our south with that disturbance that will move through Wednesday into Thursday. This will be something to keep an eye on as we head into the middle part of the week. A Fabulous Sunday Coming Up!